We have a delicious convenient food product that helps halt hunger and provides all the energy you need for the day. 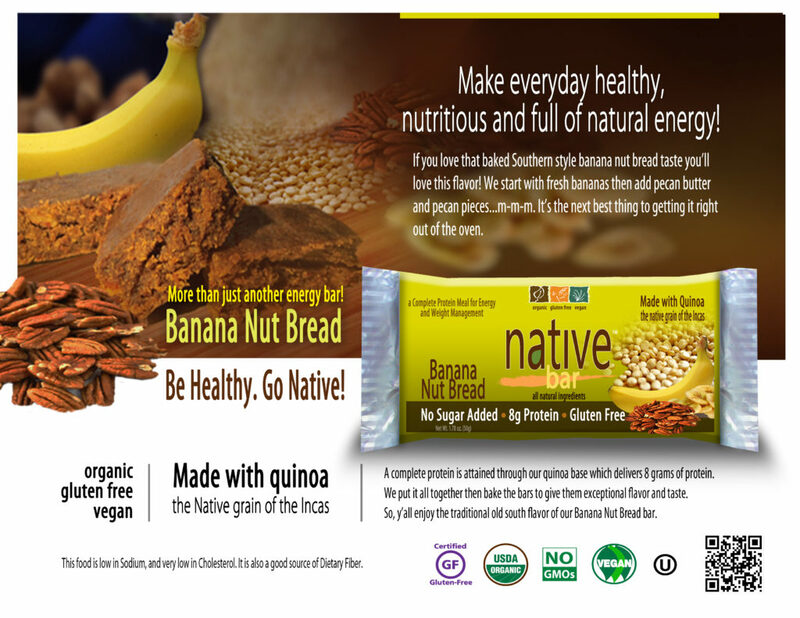 Our Native Bar is all of the following; All Natural, Gluten Free, Free of GMO, Vegan, Kosher, High in Fiber, Has No Added Sugar, and No Hormones. What more can we say? At Native we pledge to use only the best quality ingredients available. Our nutritional bars are guaranteed to be free from chemicals and pesticides. We’re not really sure why all food isn’t. Through a lot of trial and error, we found the right blend of all natural preservatives to maintain flavor, texture and moisture. And after reading Native Bar’s list of ingredients you won’t need a Google search to help interpret it. A gluten-free diet is more than just a passing fad. Many people, especially as they get older, have difficulty with digestion. Gluten free food has been proven it can help a segment of people live better. You won’t find any High Fructose Corn Syrup, Aspartame or Sucralose here! We never add sugar or chemical sugar substitutes to any of our Native Bars. Are you sustaining a vegan lifestyle? All Native Bars are absolutely guaranteed to be completely Vegan and 100% delicious! Doctors and Nutritionist recommend eating lean protein as a way to build muscle and curb appetite. Eating protein helps make the body feel full. Our Native bars are full of the lean protein, essential vitamins and minerals your body needs. Foods containing fiber can provide many health benefits. Fiber has been proven in helping to maintain a healthy weight, lowering your risk of both heart disease and diabetes. We promise that all of our food is 100% real food. Our all natural nutrition bars are just that, All Natural. We do not use any Genetically Modified Organisms in any of our Native Bars. Ever! Food safety is of paramount important to us. We insist all Native Bars adhere to the strict Jewish dietary laws known as Kashrut. Trans Fatty Acids are considered by doctors to be the worst of the worst. They are proven to raise your LDL “bad” cholesterol and lower your HDL “good” cholesterol. We never use any Trans Fats / Hydrogenated Oil in our Native Bars. There is a great deal of uncertainty if consuming processed soy has adverse health effects. For our consumers who have a concern or a soy allergy, our product is guaranteed to be 100% soy free. All of our Native Bars are made in the United States of America. With the proven history of sub-standard food safety coming from developing nations, only corporate greed could make a company take that risk.